This is probably one of the most frequently asked questions: What KPIs should we use for the compensation system? In this article, I’d like to review the best practices about using, or in most cases, not using reward KPIs. I did a classification of possible approaches to the reward system. Don’t take these levels as the levels of business maturity; your goal might be not to get to Level 4 but achieve excellence on Level 2. Any business chooses one or another reward model because of the specific business environment and the current business challenges. There is no absolute truth about which approaches should be used. The first question is, why do employees need to be rewarded? The reward is supposed to increase the motivation of an employee. According to McGregor’s “Theory X,” people hate work by their nature and need to be managed with the “carrot and stick.” In contrast, his “Theory Y” recognizes that people are actually motivated by self-esteem, creativity and personal development. Let’s use the XY Theory framework to describe possible types of employees behavior and possible managers’ attitude. 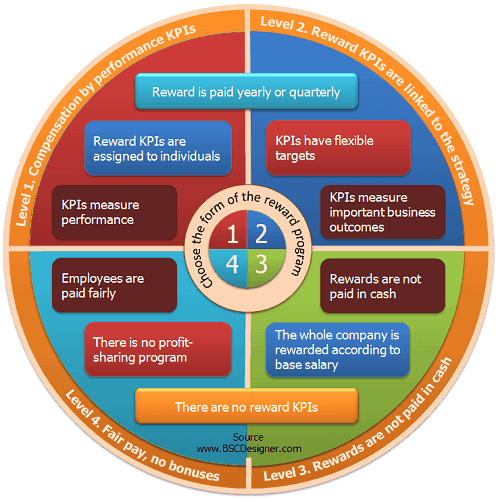 The basic idea of linking a compensation plan to KPIs is simple. Track the performance of our employees, and if they are performing well, give them a bonus that is supposed to motivate them to deliver even better results. Let’s take sales representatives as an example. The root-case connection between their efforts and the financial outcomes seems to be clear, but still the short-term financial outcomes should be validated by long-term business impact. It is hard to measure the performance of the employees, especially when employees know that their bonuses depend on the results. Companies that forget about this face situations like we reviewed in the KPIs misuse article. Use spreadsheet software to build a prototype of reward calculations. 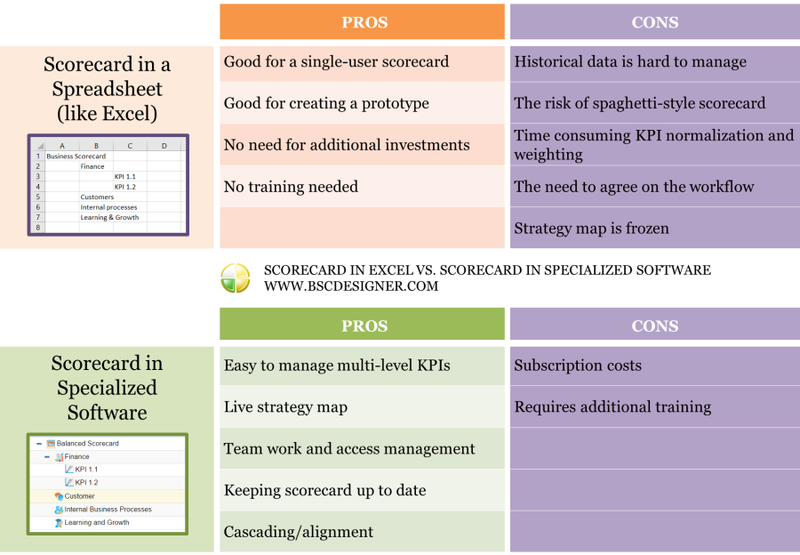 Move to the professional tool for scorecard calculation once the underlying logic is stable. A better approach would be to have a properly described strategy and link reward KPIs to the company’s strategic objectives. In practice, most managers still focus on short-term performance KPIs (see the “KPIs, Performance & Reward” research) or use strategic KPIs that don’t make sense for line managers. It is not clear if/how specific individuals contributed to the company’s success. Measuring a company’s success is an important challenge itself. If we link reward to this strategic KPI, it will probably make sense for top managers but won’t make any sense for the line-level managers. What might be a solution to these challenges? A strategic objective needs to be properly cascaded to make sense on the local level. In the case with the bank, it will make much more sense to link reward to the “local” version of strategic goals that have some relevance to the employees that are being evaluated. On this level, employees are not compensated with financial bonuses at all. The idea is that why should one be paid twice (first time with a salary and second time with a bonus) for the same job? Southwest Airlines has a bonus program, but employees won’t see funds soon as the company invests them in an employee retirement plan. There are no cash bonuses, so any short-term approach to game the system won’t work. Teams are compensated in the form of shares that by definition are linked to the financial success of the company. A talent strategy of the company is never isolated from the market. If cash bonuses are traditionally paid for a certain role, then it might be hard for your organization to shift from Level 2 to Level 3. Be ready to see the decrease in your talent hire and retention indicators. Compensate them with higher engagement. Although there are no bonus KPIs, your team still needs to know about the goals of the organization and still need to measure their performance. 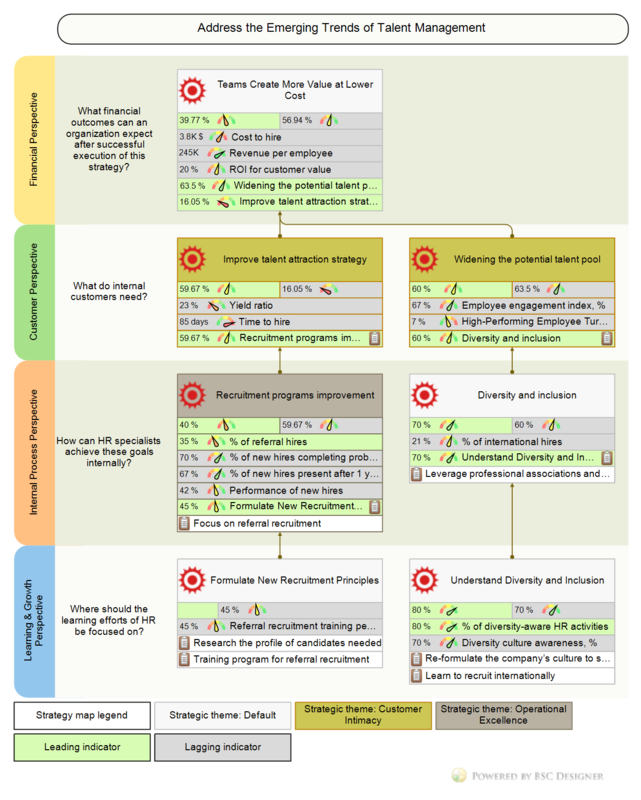 HR Balanced Scorecard online - sign-up with a free account for immediate access to 16 scorecard templates. In the previous article, I mentioned that Apple can afford to have a higher than industry average turnover rate and still find and retain the best talents in the industry. What about their reward system? According to information available for the public, Apple suggests its employees stock purchase plan and product discounts. For example, in 2012, Apple was giving its employees a good discount on a new Mac and iPad. Well, this might be considered as a reward as well as an employee engagement program. Apple’s senior executives are in the list of Top 5 best-paid. Besides base salary, they were paid compensation in the form of stock. This was done with a specific purpose: “to retain the company’s executive team during the CEO transition.” As for Apple’s CEO Tim Cook, the new initiative links Cook’s stock award to the company performance index in the Standard & Poor’s 500. Henry Mintberg, a professor at the Faculty of Management at McGill University, suggests an even more extreme point of view. In his article for The Wall Street Journal, he doesn’t suggest any cure to the problem of executive bonuses; he just says that “the problem is that they [executive bonuses] exist”! The author talks about five reasons why executives should not be paid any bonuses. As a possible alternative, he names paying bonuses to all employees according to their base pay (similar to what was discussed on Level 3) but still sees that there is a possible problem as performance can never be evaluated correctly taking into account a long-term perspective. It is obvious that to be able to operate on this level, a company needs to have a strong leadership 100% focused on the “Theory Y” way of working with employees. Also, the company should have an established brand among potential candidates to be able to afford to filter out employees that are motivated mostly by compensation plans. How are the employees motivated then? Sense of meaningfulness. Understanding the purpose. A mission statement on the strategy map should help with this. Sense of choice. The employee understands the goal and can choose the best way to achieve it. On the level of strategy description, this means that the strategy is a product of discussion on each level, not just the set of goals mandated from top managers. Sense of competence. A sense of high-quality work done. Before, we discussed how a company can quantify and measure quality. Sense of progress. A sense of moving in the right direction. That’s probably the best way the KPIs can be used. These four will look very familiar for those who estimated employee engagement using the Q12 index. Similar to Level 3, you might find out that your innovative reward practices are not shared by your industry colleagues. You’ll need to break many mental barriers of managers, HRs, and employees. You’ll need to find the fair salary level that can be justified to the board and attracts enough candidates to your hiring funnel. Your team will need to do the intrinsic motivation seriously (See the tools section below for some tips). Quality Scorecard online - sign-up with a free account for immediate access to 16 scorecard templates. How Can BSC Designer Help? Here are some typical scenarios of how BSC Designer software can help in terms of reward and performance calculation. Level 1. Use BSC Designer as an alternative to Excel, especially if you have some complex scorecard calculations with different measurement scales, normalization, weights, various performance functions. Level 2. Use BSC Designer to create your Balanced Scorecard and map business goals into the four perspectives. Link to the lagging indicators to get the performance figures for bonus calculation. Level 3. Cascade strategy across your organization and align top-level goals from Balanced Scorecard with local-level goals from light-weight OKRs. Level 4. 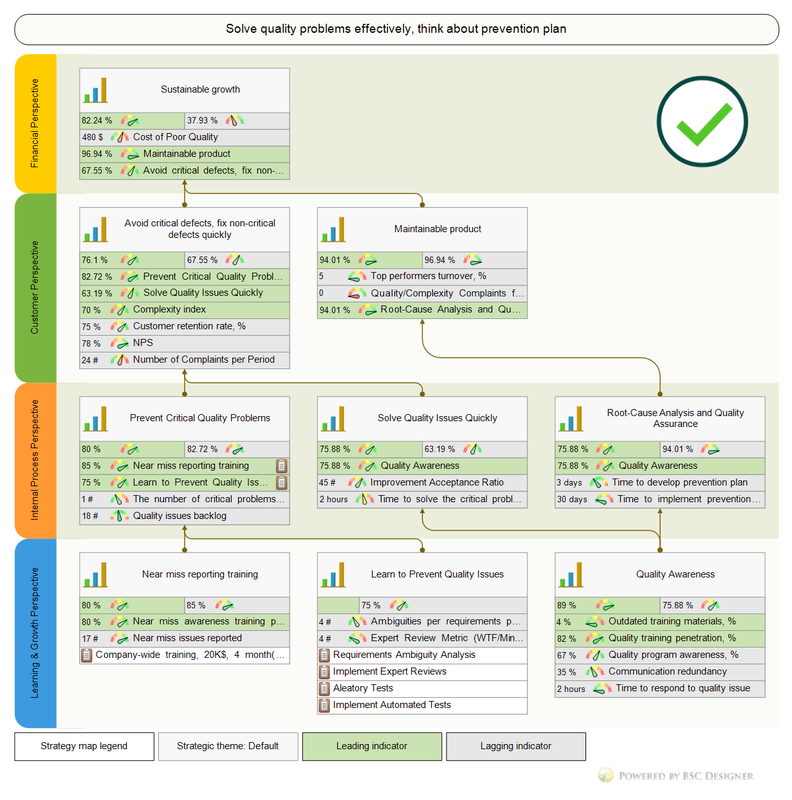 Use BSC Designer to track strategy execution, including its quality and innovations aspects. Where is the Golden Mean? As we can see, there are different approaches to compensation programs. There are companies like Apple that follow a traditional model and can afford this. There are organizations like Southwest Airlines that prefer to focus on retaining people that are not looking for bonuses. The executive compensation practice might be something that doesn’t help or even makes damage (See ideas by Henry Mintberg mentioned on Level 4), but they still are used widely. Match the reward program with the business environment. Choose the form of the reward program according to your current business challenges. Link to what actually matters. Don’t link reward programs to an employee’s performance; instead, link reward programs to the tangible outcomes of strategic objectives. Reward teams, not individuals. Consider the shift from rewarding individuals to rewarding teams or the whole company. No cash rewards. Avoid rewards in the form of cash, as stock purchases work better. Intrinsic rewards. Help your team to master intrinsic motivation and rewards.